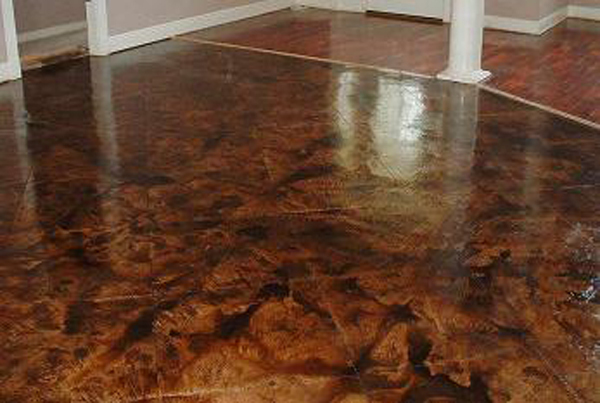 Acid Stained Concrete Floors, are they for YOU?? Comments Off on Acid Stained Concrete Floors, are they for YOU?? Here are a few FACTS!!…. Regular Concrete Flooring is Dull, gray, boring and just plain ugly, but we have a solution, what if I said it’s been given a face-lift?, what if I said it’s inexpensive?… what if I said it was virtually maintenance free?…guess what it is? ?… well it’s Decorative Concrete Flooring of course!!! This flooring alternative is rapidly rising in popularity. Concrete Overlay Coatings have been a long time standard in the Southwestern part of the United States, Decorative Concrete has caught on nationwide because of its beauty and versatility. Having shed its drab ugly appearance, today it is being transformed into works of art. Chipped, stained and damaged pool decks, driveways and interior floors can be resurfaced and made to look like beautiful natural stone at a mere fraction of the price of replacing it. Concrete is the new interior and exterior design King. Few materials can compete with concrete when it comes to versatility. It can be molded into any shape, stained or dyed to match nearly any hue and exhibit textures ranging from rough to highly polished. Concrete can be given a whole new look with engraving, acid staining, texturing, overlaying or resurfacing. Most acid stains are a mixture of water, hydrochloric acid, and acid-soluble metallic salts. They work by reacting chemically with the hydrated lime in the stain producing color in the concrete. When acid stain is applied to a concrete surface it creates a mottled, uneven, translucent color. This coloring process gives the surface a look similar to weathered stone, slate or marble. Since each concrete slab has a slightly different chemical combination colors in concrete can vary. Acid Staining unlike paint is not a coating. Therefore, the color becomes a permanent part of the surface and will not chip, flake or peel. Since acid stain is translucent cracks and other imperfections in the slab give a weathered look of character. Concrete acid staining isn’t something that should be done by a novice. There are so many things that can go wrong with the application from spills on your walls or driveway, to eating a hole in the floor of your car or truck if not handled properly. However an experienced applicator can produce a one of kind work of art with concrete and acid stain. Intricate designs can be scored or etched into your surface giving the appearance of tile or stone. Stained concrete floors seem to be everywhere — in homes, at work, in stores and shopping malls, schools, sports complexes, hair salons, anywhere there’s concrete. You can custom design your surface. Easy to care for, cleans easily with a damp mop. Very durable, with care will last a lifetime. Costs less than carpet, tile or hardwood!! Grab your phone and call us today for a No Obligation FREE Quote!! Leave your contact information on our contact page here and I will be sure to get back to you as soon as possible.